How utterly fitting today’s tarot pull is for me. 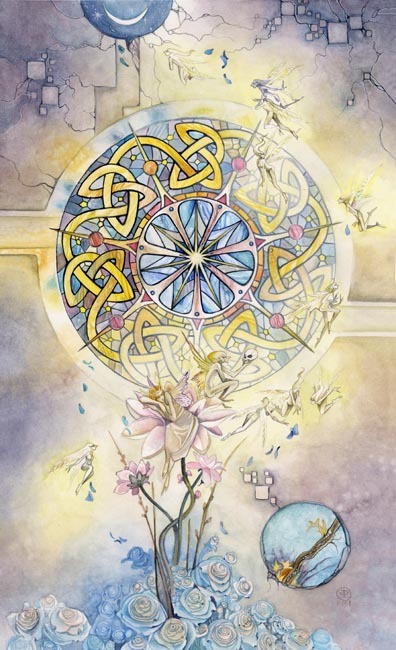 The wheel of fortune is all about turnings and returnings, cycles of birth and death and birth again. It’s one of my favorite cards, hand in hand with Death, as they mean similar things and remind us that the ending of one thing is, after all, the beginning of something else. Today is my last day with my old car. The new one is sitting at the dealership waiting for me. It has a radio that works, air conditioning, new tires – all the new stuff that a car has. My old car’s radio barely works, the tires are old, the brakes squeak, the a/c hasn’t worked in like 8 years. It’s an ending, a loss – and I’l really miss that old bomb. But I’m also really excited about the new car, not gonna lie. As I shuffled the deck this morning, I was thinking about my old car, how today is actually the last day with it, and I’ll never see it again. It’s a goodbye, a loss, an ending. The wheel jumped out to remind me that it’s also a beginning. Apropos of nothing, I’ve also decided I want a viking funeral. How cool would that be? This is great. I am interested in Tarot as well. Do you think they’ll let us bring beer to the library? We could always go to the Beerbrary…unless the cards forbid it.